Dead Even, the second electrifying thriller from #1 New York Times bestselling author Brad Meltzer (The Tenth Justice) poses the blood-chilling question: How far would you go to save the one you love? 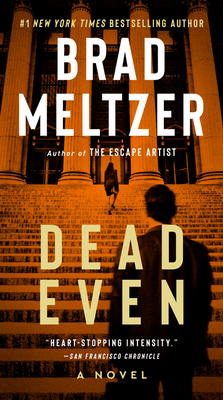 Meltzer, who occupies an honored place among the top names in the thriller profession—the legal thriller and Washington D.C. intrigue specialists (Grisham, Baldacci, Martini, Turow, Lescroart) as well as Patterson, Kellerman, Deaver, and other masters of mainstream suspense—comes back strong with Dead Even, as adversarial husband and wife lawyers battle in the courtroom, each knowing that the other’s very life depends on the verdict. Brad Meltzer is the number one New York Times bestselling author of The Inner Circle, The Book of Fate, and six other bestselling thrillers. He is also the host of the TV show Brad Meltzer's Decoded on the History Channel. He lives in Florida with his wife and three children. His sons prefer the book Heroes for My Son. His daughter prefers this one.